I had to have some fun today. . . . I decided to play with my dishes! Thank you to my MOM and DAD who got me started collecting these beautiful dishes (made in the USA!) They gave me my first set 10 years ago. In case you don’t know, it’s FIESTAWARE, made by Homer Laughlin China Co. The most valuable and collected color is called “medium green” and I have one piece of it, it’s the teacup seen here on top of the stack of plates. It’s the color of John Deere tractors. 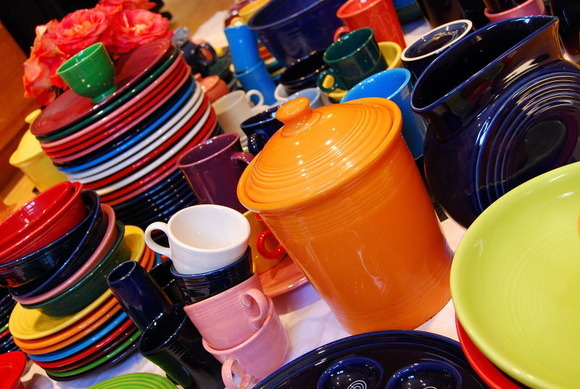 This entry was posted in Uncategorized and tagged fiestaware by Shanda. Bookmark the permalink. I’ve know for a while now that you love and collect Fiestaware so when I run across some I usually think of you. I have one red mug in my mug drawer that I have no idea where it came from. I usually say a little prayer for you when I sip my coffee from that mug. The colors are lush!!!!! I’m thinking….”colors for my next quilt!”. So nice!! I love the colors and these pics! Oh. My. fabulous!!!!!!!! now i’m going to stare a little longer…. Gorgeous! What a colorfest. I have a dark blue Fiesta creamer just since Sunday when my husband’s parents gave their children some dishes of their grandmother’s. I thought of you when Freeman picked the stack that had that little pitcher on it. Caleb’s sentiments are mine exactly! “OH WOW! WOW!” This is beyond pretty….it’s DAZZLING!! I think that the only piece I have was used by my son who let his pet snake curl up in it with for a bath….the Deere green. I love the pictures-I am actually thinking about starting my own collection. 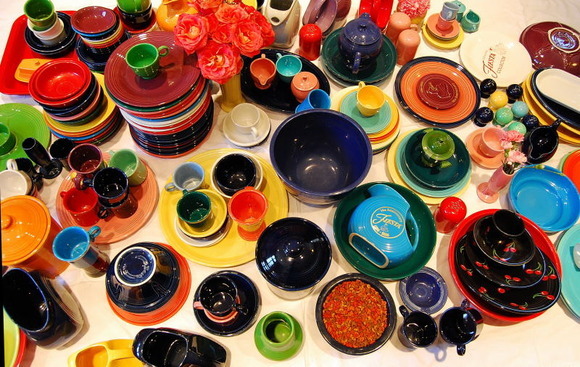 I am due for some new dishes and I love that you can mix so many colors together so they will never go out of style. The colors are so vibrant. Wow! I don’t think I knew how much you had. But you do use it every day… I didn’t think you had a tea pot. Is that a new purchase? 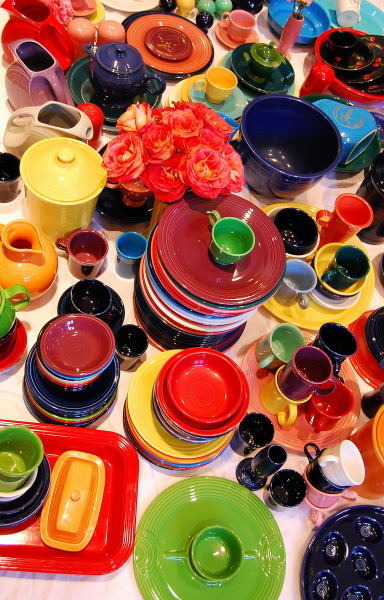 I’ve always loved fiesta ware…..so pretty! Do you use them for everyday dishes…or just special occasions? What a wonderful collection — you can use it everyday and enjoy it for years to come! Very pretty. I love all the colors together. I like the set with the cherries. So very pretty! Thank you for sharing. Fun!! Fiesta will always make me think of you! I love the black ones with the cute little cherries! You do very interesting things when you get creatively inspired!!! I love it!!! 🙂 Very colorful….sorta like you!! What a wonderful collection! A feast for the eyes! Beautiful. Very nice pictures! WOW that is a LOT of dishes! Where do you keep them all?! 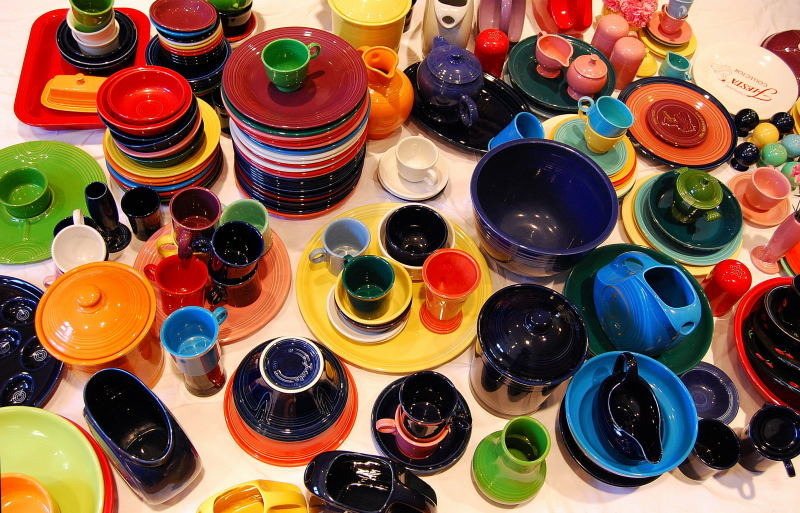 i used to collect fiesta ware. my favorite was a yellow pitcher…very similar to your turquise one. when we moved 7 times in 1 year, i downsized….and sold it. my dishes were old. i wasn’t aware they still made it. anyway……if you’re ever having a bad, sad day, i suggest you feast your eyes on all that happy COLOR! your pictures are always SO CREATIVE and FUN to look at. i LOVED your previous “book” post also! Very Festive! I love Fiesta wear! You have a wonderful collection. Your collection is so colorful and beautiful! I love it! Such happy colors- this post made me smile! While browsing through my subscriptions, my curser zoomed right by the heading that told me you had posted, but as soon as I saw the Fiestaware, I knew this was a post from you! I love all the colors. Okay class – today’s word is OBSESSIVE!! Please note the lovely pictures of dishes. Tomorrow we will cover Homeschooling and its affect on the modern woman’s psyche. WOW! That is a pretty impressive collection! I wouldn’t want to have to put it all back! LOL! We collect cobalt blue glass here. We like to poke around second hand shops, and we have found a lot of it. Maybe sometime I will take some pictures. I love the way it looks with the sun shining through it. I love fiesta wear, so pretty and colorful! Quite lovely! Ok….so now that I need a big for my drool!!!! Hahaha! Sick I know! But oh, I love, love, LOVE IT!!!!!!!!!!!!!!! (did I get enough in that time?!?!?!?!?!) I could have put more for how I REALLY feel about it…but maybe, just maybe that gave you a bit of a taste of how much I LOVE IT! :o) I could look at these pictures forever just trying to see all of the pieces! How fun!!!! Fiesta is my FAVORITE!!! Ok, I’ll be quiet now since I honestly could go on for quite some time…but I am thinking I need to go and make my pot of tea (out of my fiesta tea pot) and drink a nice big cup out of my Persimmon ring handle tea cup! :o) Hahaha! Have a wonderful day! LOVE the dishes! Where can you find them? are they hard to find? is it expensive? can you go the lazy way and by a multi colored set? sorry for the so many questions! Viva la Fiesta! WOW so gorgeous. My grandma had several old fiestas, which now belong to my aunt. What a glorious collection. I collect tea pots, nothing nearly so colorful. What a treasure! The colors are so rich and striking. Thank you for sharing your beautiful collection! So, Shanda . 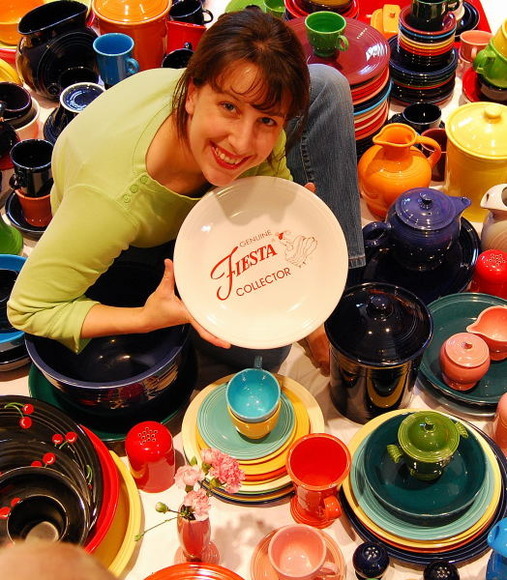 . . Is it safe to say you like Fiestaware, or something? LOL!!!! Wow — I love the colors. 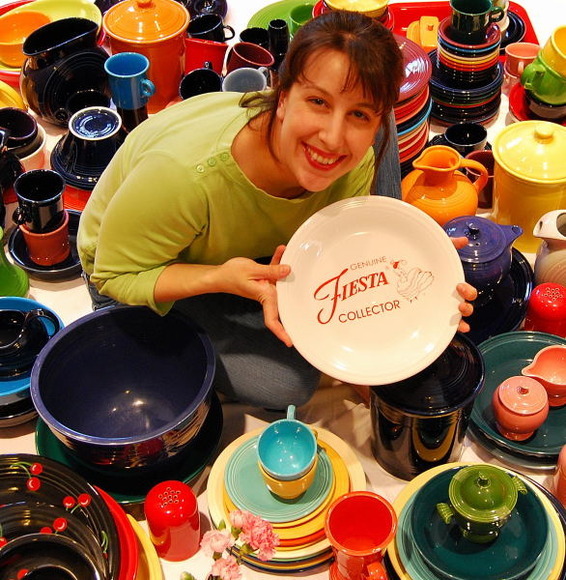 I can’t believe I’ve never heard of Fiestaware. I like your idea of having a lot of different colors. Very out of the box! So would you set your table with a different color for each person then? What a fun idea! WOW, that is a very impressive collection. Very pretty colors, I like the green tea cup the best. fuN! when we were first married i had the cobalt blue and yellow dishes… i ended up selling them at a yard sale for i know not a fraction of what they were worth. :0 some lady was super happy. wish i still had them. Is that cherries on the one? never seen FW with a pattern. i like. :)and you’re adorable btw. Wow! that’s one colorful collection! wow! what a fantastic collection!! I love Fiestaware. It is so pretty and the colors are so vibrant. We haven’t had any new dishes since we got married almost 18 years ago and we don’t even have complete sets anymore. I think I would like to get some of these when we buy new dishes. wow that calls for a big oarty with lots of food! I am salivating at your collection! thanks for sending me to this link!! I had so much fun looking at these pictures… only problem is now I have found something else that I want to spend what little money I have on!! 🙂 They are so festive and cheery… I could use a pick me up like this on a regular basis. I am curious as to where you store it all. How many pieces have you broken? I apparently wasn’t “following/stalking” you this long ago… now I might have to spend a few days being nosy into your past posts!! How do you keep track of your posts? how did you know where to find this? I have been wishing I had an easy way to find certain posts that I have done in the past, just curious if you had a solution.thanks for my “hugs” I always need them! !